After a hiatus of a few months, I’ve decided to try to revive the blog a bit. So we’ll see how that goes! Anyway, last Columbus Day, we took a trip with my parents to Martha’s Vineyard. 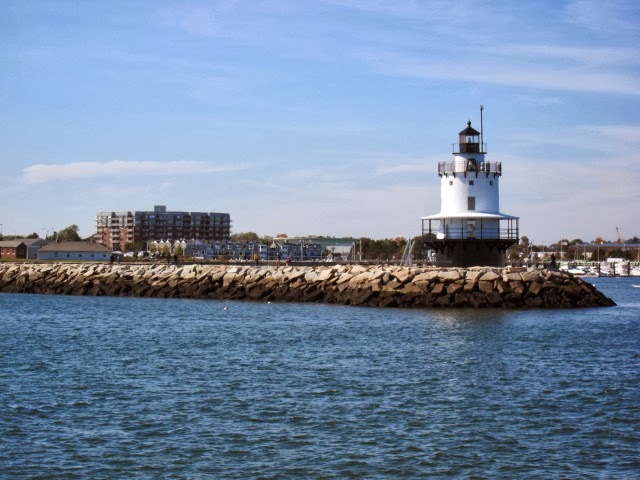 We didn’t have that kind of time this year, but since I had some leftover Hilton points lying around, I booked us one night at the Hampton Inn in downtown Portland, Maine for 40,000 points. It turned out to be a great trip! 40,000 points felt pretty steep for a Hampton Inn, but the nice thing about Hampton Inn Portland Downtown is it’s very centrally located so we can walk everywhere. The nightly rate was actually $279, so I got 0.7 cents per point of value, which isn’t too bad for Hilton points (which people generally value at 0.5 cents per point). I expected to be charged for taxes and fees but that never happened, though I’m not sure why. Anyway, things were looking even more up when I heard the magic words “As a loyal HHonors Gold member we would like to upgrade you to a suite.” Sure! We were given a gigantic corner room with a living room and a great sunny view. This was really convenient for Baby M since we could keep her in a separate portion of the room when she slept (there was a room divider although no wall). Anyway, we didn’t spend too much time in the room, but it was really comfortable and a great surprise to be upgraded! HHonors Gold status doesn’t guarantee an upgrade, but it greatly helps your chances (I’d say I’ve gotten upgraded around 50% of the time). There are two easy ways to get HHonors Gold status. The first way is to apply for the Citi Hilton HHonors Reserve card, which grants automatic gold status ($95 annual fee, 2 free weekend nights after $2500 in spending). The second way you can get HHonors gold status is to sign up for a Milepoint Premium membership ($50, status good until Feb 2015). Even if you don’t use Milepoint at all, you get HHonors gold status for $50. Even if you get two upgrades that’s $25 per upgrade (plus you get free internet and other benefits), so it’s not a bad deal. There are also other benefits to Milepoint Premium, most notably 1,000 United miles. They supposedly only have a limited quantity of premium memberships, FYI. We were most interested in eating in Portland. When you have 24 hours, there is only so much you can see and eat so we did our best. Here’s where we went in order of how much I enjoyed the experience. Gelato Fiasco will put as many flavors as can fit into your cup! They claim to have authentic Italian gelato with a New England twist. I must say, their consistency was excellent and it was nice to have gelato with a more American feel (e.g., you can sample the flavors which they never let you do in Europe). We went twice and did not regret it! Yes, twice in 24 hours. 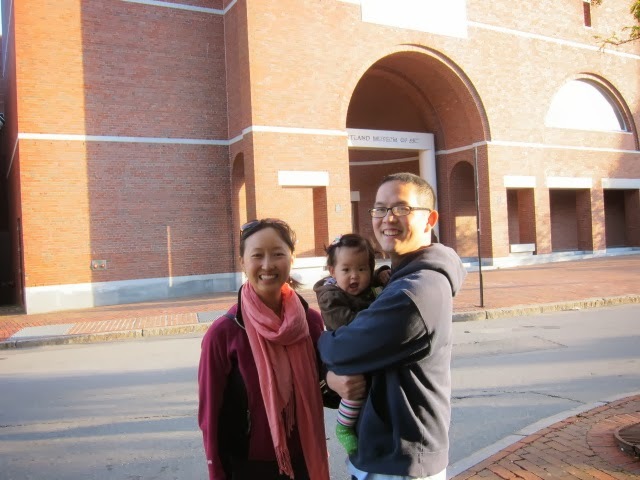 We really wanted to eat at Fore Street, but couldn’t make reservations due to baby schedule uncertainties. So after Baby M went to bed, we got a table at Street and Company who share the same owner. 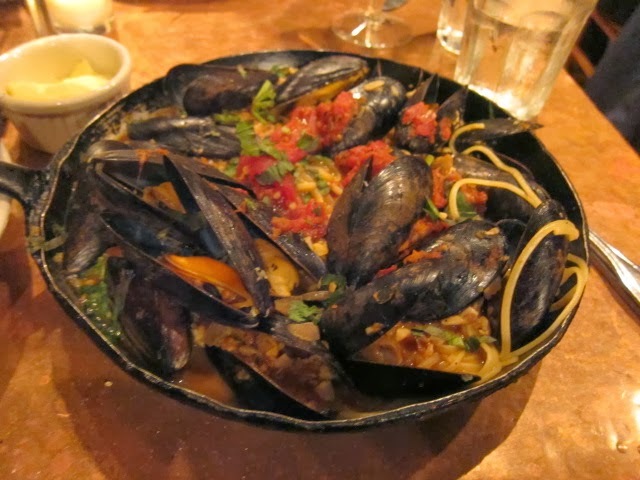 The food was excellent – especially the small Taleggio plate we started with and the Mussels Marinara. 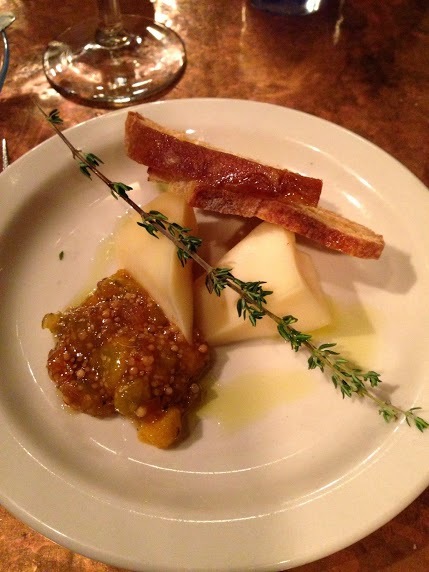 If Fore Street is even better than Street & Co. – color me impressed. Anyway the food was excellent, our waitress was super friendly and the ambience was great. This is the bakery owned by the same owners as Fore Street and Street and Company. Wow, they sure have a monopoly over Portland. Anyway, their baguettes are amazing, although according to Jess their chocolate croissants left something to be desired. Still, I consider Standard Baking Company a must visit for people in Portland. Eventide is where we had brunch as soon as we got to Portland. It’s a small restaurant with mostly bar seating, but it has a great vibe and a ton of oysters. 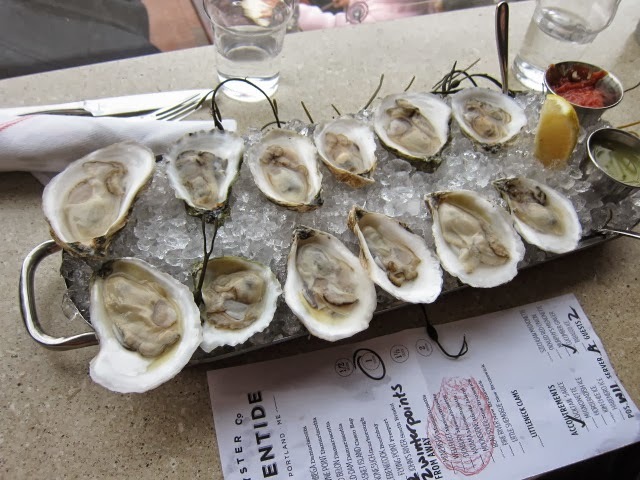 I was kind of whatever about the food, but the Oysters were great, including a lot of Maine varieties I’d never tried before. A great food stop even if its at the bottom of this list. 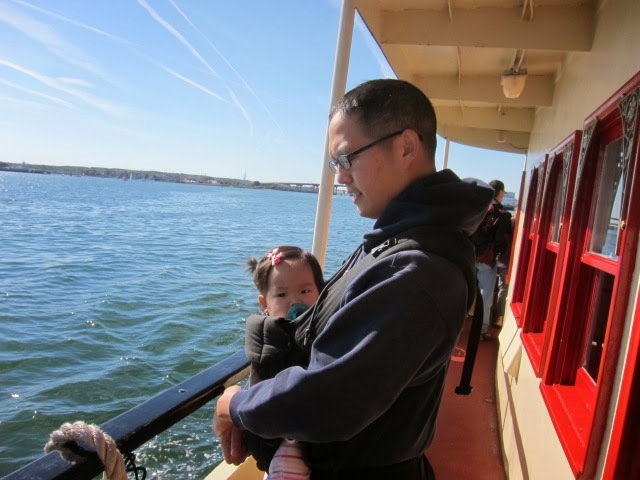 We were only in town for 24 hours, but we managed to hop onto a Casco Bay cruise the morning before we left. It was about an hour and a half, beautiful weather, and I was pleasantly surprised by the tour guide (I generally don’t like them). A relaxing way to spend a morning. For some reason there was this large pillow in the museum – I hope you were allowed to sit on it! Portland’s art museum is actually pretty great. I really like the architecture and the pieces they have in their permanent collection are pretty impressive for such a small museum. They also had a rotating exhibit featuring Maine artists that we really liked. Quick trips like this are why I’m thankful I spend so much time focusing on earning points. Being able to drop 40,000 points at the Hampton Inn instead of almost $300 really enabled us to take this trip. 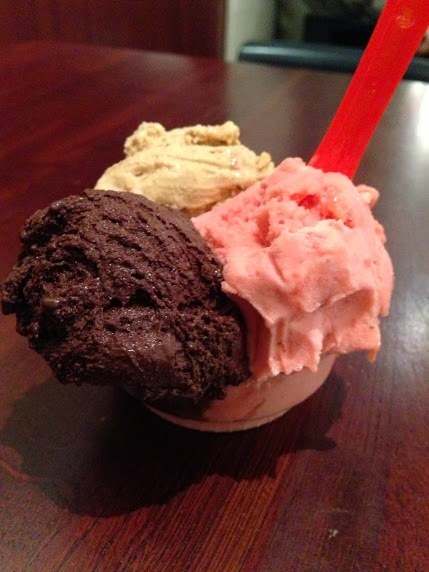 All in all, Portland is an amazing town and I’d totally recommend it – especially Gelato Fiasco!